The trash and recycling contractor is Trash Away LLC. If Trash Away fails to collect trash or recycling, call them at 703-339-4560. The community will be notified of any "no collection" days and special collections such as Christmas trees. Trash and recycling may NOT be put out on "no-collection" days. Trash must be put out in covered trash containers or heavy duty plastic trash bags. Use of grocery bags or boxes is prohibited. Trash containers, lids, and recycling bins should be clearly marked with the owner's house number. Trash is collected Mondays and Thursdays as early as 6:00 a.m. Recycling pickup is on Thursdays only. Trash containers, trash bags, and recycling or other materials may only be put out after 6:00 p.m. the evening before or the morning of collection days. Trash containers and recycling bins must be retrieved and placed back inside the residence or within the fenced portion of the rear yard by midnight of collection day. Trash containers stored in the front yard or side yard is prohibited. Residents who are unable to place trash out within the listed times (for example because of an out-of-town trip) must either hold the trash, etc. or arrange for someone to put it out and retrieve any container or recycling bin. A. 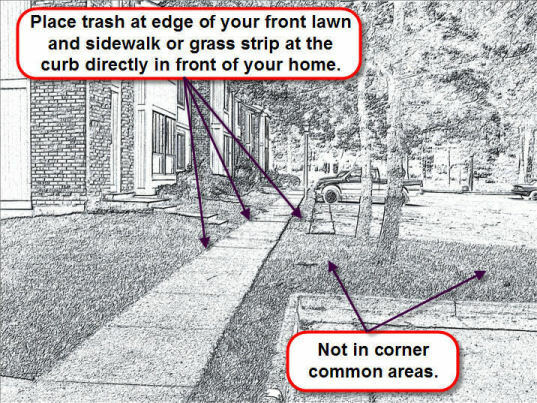 Place trash only on the edge of your front lawn and sidewalk or the grass strip at the curb directly in front of your home. c. Near or next to any fire hydrant or mailboxes. If for any reason, trash or recyclable material is not picked up, residents are encouraged to call Trash Away (703-339-4560) for late collection. Regardless of fault, uncollected trash and recyclable items must be retrieved by the "owner" not later than midnight the day of missed collection and placed inside the residence or fenced portion of the rear yard. Regardless of fault, if any portion of a resident's trash is spilled on any part of the grounds, it is the responsibility of the resident to pick it up. Spilled trash found on the parking lot, curb, or sidewalk adjacent to a residence will be presumed to belong to the occupant of the residence. The Board of Directors may charge a $50.00 assessment for each violation. A. Recycling (THURSDAY PICK UP ONLY): Newspapers (newsprint only - black and white or comics) are to be kept separate. Bundle in brown paper bags or tie in bundles with twine. Place in or beside recycle bin. Glass, bottles, and metal/aluminum cans should be rinsed and placed in the recycle bin. B. 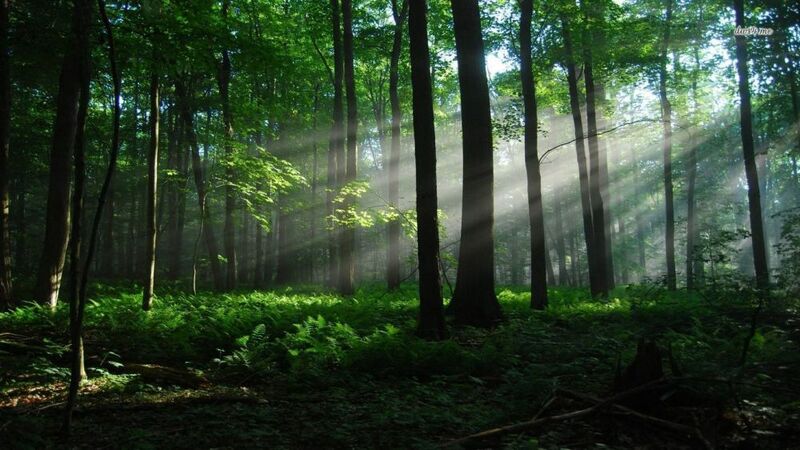 Tree and Shrub Debris must either be bagged in a black trash bag or cut and bundled into 3-foot sections. C. Large Trash Items, such as furniture, televisions, etc., will only be picked up on Thursdays. D. Hazardous Materials such as paint cans, car batteries, and building materials (e.g. lumber, windows, and doors) will not be picked up. It is the responsibility of the homeowner to dispose of these items properly. E. Appliance or “White Goods” Fairfax County law requires all white appliances, such as refrigerators, stoves, dishwashers, etc. to be disposed of separately from trash. All residents are required to either arrange for separate disposal of these items directly with the trash contractor or properly dispose of these items themselves. In addition, Fairfax County has collaborated with manufactures of household appliances to identity owners of appliances that have been improperly disposed, such as in wooded areas. The law allows that penalties of up to $1000.00 may be charged for improper disposal of household appliances.